Using natural dog food recipes to make your own dog food provides your dog with a nutritious diet. Use organic and all natural dog food ingredients to make dog food that is tasty and healthy. Why Should You Make Your Own Dog Food? Dogs eat too much refined foods. 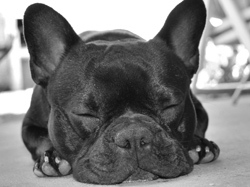 Commercial dog food is often grains, fillers, chemicals, and other less palatable products. Dogs used to eat fresh and/or raw food. However over time, pet food companies have made good profits producing commercial foods that just don't provide the full nutritional value that dogs need. There are more choices than wet or dry commercial foods. Historically, dogs have never had grains as a part of their diet; just because we are feeding them this dry food doesnt mean that we are giving them what they need to lead long, healthy lives. Here are some all natural dog food recipes that are healthy for your dog and easy to make. Sidenote: An average 50lb dog will eat around 1 lb of cooked or raw food daily, so if you have a smaller, 10lb dog for example, then adjust the food to about one fifth of a pound. Also remember, changing your dog's diet may require you to gradually introduce or integrate all natural dog food recipes with the store-bought dry (or wet) food. You can do this over a period of a week or two so that your dog's digestive system adjusts gradually to the new all natural dog food diet. The following recipe is a single serving (1/2lb). Keep the raw meat separate from the vegetables until it's time to serve, then mix together in a bowl. You can keep the raw meat in your fridge for up to three days so cut into bite sized pieces, keep it well wrapped, and use daily. 3/4 cup of chopped meat. Please note: a variety of meats is best for your dog. You can use beef, lamb, chicken, fish (without the skin), and even mix in their organs but make sure you trim off the fat. Ask your butcher if he has any left over meats (off-cuts) to make dog food with. 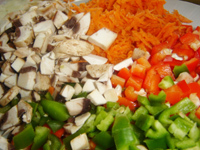 1/4 cup of diced vegetables, the more variety the better. Also, use whats in season and what you have around the house: carrots, broccoli, cauliflower, brussel sprouts, celery, peas, green beans and more. Remember to use whats fresh and dont be afraid to serve raw food to your dog. However if you don't like the smell or look of raw food then stir fry the meat and vegetables with very little/to no oil (in a bit of water) - that will still provide a healthy and nutritious meal for your dog. And use this natural dog food recipe to give your dog a special treat; we actually made this quiche for our dog's birthday - we had friends with dogs come over (4 in total) and the dogs gobbled this up for their dinner! Preheat oven to 375 degrees Fahrenheit. Whisk egg, milk and cream together in a bowl, then pour into pie crust. Add meat and sprinkle with cheese. Bake for 30-45 minutes and then let cool. Sprinkle fresh parsley. 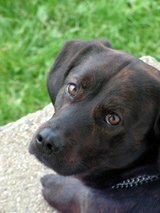 Remember you know your dog best; and your veterinarian probably knows your pet second-best! Make sure to talk to your vet about any allergies or illnesses your dog may have - or any concerns you may have - before you make your own dog food. 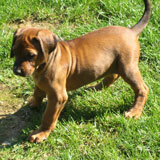 And do some more research and test natural dog food recipes to find out what your dog likes best. Often when dog owners start cooking all natural dog food it's because their dog has developed food allergies or other digestive issues. Before you change your dog's diet, discuss possible triggers and remedies with your veterinarian. By controlling your dog's diet, and making your own dog food (using all natural dog food ingredients and recipes), you can really help improve your dog's health. Return from Natural Dog Food Recipes to Dog Food Recipes.